In order to make a blade as sharp as it can possibly get, Murray performs a comprehensive four-step refurbishment process to your blade. 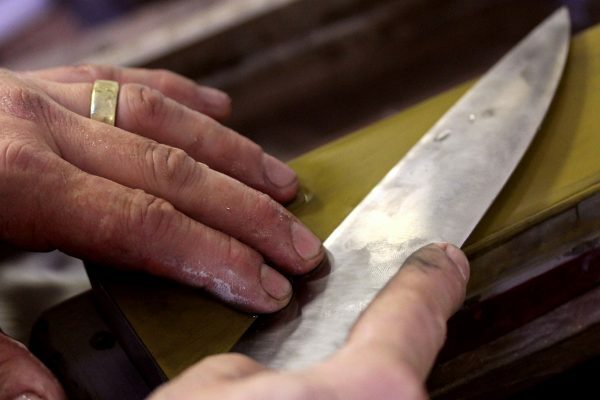 First, he straightens the blade as most blades are warped to some degree. Second, he re-grinds the secondary edge for vastly improved cutting geometry. Third, he polishes the secondary edge for friction reduction and ease of maintenance, and Forth, he re-establishes the primary edge (cutting edge) and then hand-hones it on super-fine Japanese waterstones. The whole process takes about 40 minutes. In order to experience the “Scary Sharp” Carter Cutlery edge, carefully box and ship your knife to us for hand sharpening. The cost is $30 for the first knife and $20 for each additional knife. Murray looks forward to the opportunity to share his hard-earned skills with you and believes the experience of receiving your better-than-new knife can be the start of a relationship that will last a lifetime. Our typical turn around time is one week. A note to international customers: DO NOT write kitchen knife on the product description or there may be a brokerage fee applied by customs. A simple “knife sharpening and/or refurbishing” will do. *Some knives may cost more to sharpen depending on length and time necessary to create the proper edge geometry or to fix damage. We no longer sharpen straight razors of any kind.